It’s no surprise to educators that academic vocabulary is a hot-button issue, especially with the Common Core State Standards (CCSS) and the much-anticipated, related assessments. We’ve known for years that there’s a strong correlation between vocabulary knowledge and comprehension, and revisiting this relationship is critical to helping students meet the challenging new literacy standards. Content Vocabulary: Subject Specific and Technical Terms. Key words, terms, and phrases related specifically to the topic of a lesson; these words and terms are often highlighted in textbooks and students must know them to meet content standards. 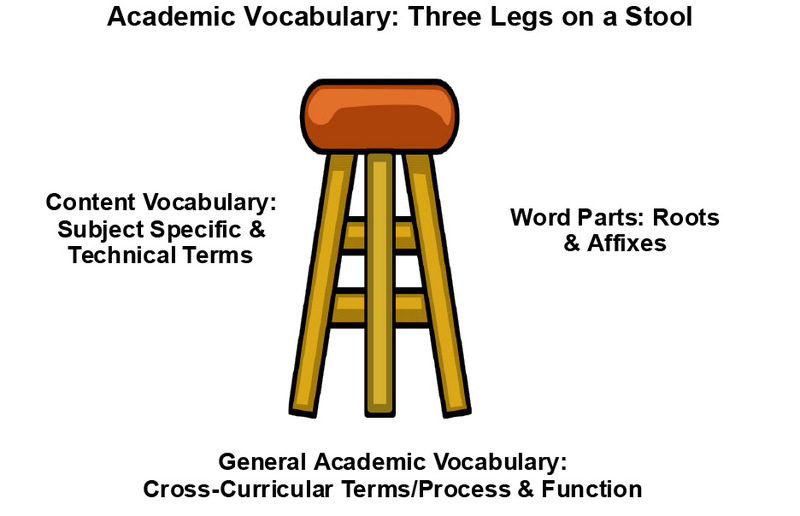 General Academic Vocabulary: Cross-Curricular Terms; Process and Function. Words, terms, and phrases used across all academic subjects, including functional language, language processes, and classroom tasks; examples include: describe, define, list, summarize, compare and contrast; support your answer with evidence; debate; argue a position; these are also often found in content standards and standardized tests, and are especially challenging for English learners and struggling readers. Word Parts: Roots and Affixes: Enable students to learn new vocabulary, primarily based on English morphology (affixes, roots, base words). For example, note the meaning of –photo (light) in each of these words: photosynthesis, photocopy, photograph, photography, photoelectron, photo-finish, photogenic. An important adage about English (and other languages with roots and affixes) is: Words that are related by structure are almost always related by meaning (Bear, Invernizzi, Templeton, & Johnston, 2011). Contextualizing vocabulary instruction in order to make the invisible visible. Teachers do this by providing students with visuals of key vocabulary, such as photographs or illustrations, to clarify a word’s meaning. An activity such as 4-Corners Vocabulary Chart (Vogt & Echevarria, 2008, p. 40), is a perfect way to contextualize an academy vocabulary word: a) divide a paper into fourths; b) in upper left corner, insert a picture that provides clues to a word (picture of a puffy cloud); c) in lower left corner, provide a definition in student-friendly terms (A white billowy cloud type with a dark, flat base); 3) in upper right corner, include a contextualized sentence (The fluffiest clouds that look like cotton, are called cumulus); 4) bottom right corner, write the vocabulary word (cumulus). Students can make their own 4-Corners charts and booklets for any subject area. A bike can’t stand alone because it’s two-tired. Academic vocabulary instruction need not be a chore for either you or your students. Because of its relationship to comprehension, the more you attend to academic vocabulary development, the more likely it is that your students will also be developing their comprehension. I hope that your school year is productive, happy, and full of words and reading! MaryEllen Vogt is a co-author of 15 books, including Making Content Comprehensible for English Language Learners: The SIOP Model (2013), Reading Specialists and Literacy Coaches in the Real World (2011), and The SIOP Model for Teaching English Language Arts to English Learners (2010). Bear, D.R., Helman, L., Invernizzi, M., Templeton, S., & Johnston, F. (2011). Words their way with English learners: Word study for spelling, phonics, and vocabulary instruction. (2nd Ed.). Boston: Pearson. Echevarria, J., Vogt, M.E., & Short, D. J. (2013). Making content comprehensible for English learners: The SIOP Model (4th Ed.). Boston: Pearson. Echevarria, J., Vogt, M.E., & Short, D. J. (2014a). Making content comprehensible for elementary English learners: The SIOP Model (2nd Ed.). Boston: Pearson. Echevarria, J., Vogt, M.E., & Short, D. J. (2014b). Making content comprehensible for elementary English learners: The SIOP Model (2nd Ed.). Boston: Pearson.